Navigating a grocery store when trying to stay healthy can often times be intimidating, overwhelming and a bit tempting. 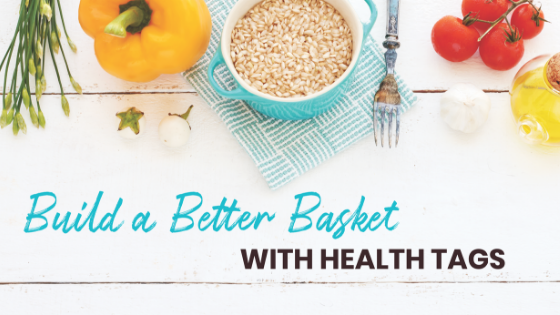 That’s why our Registered Dietitians have identified Market Street items storewide with twelve little health tags to help you create one healthier basket. Checkout tags like whole grain, heart healthy, fiber, low sodium, protein and sugar free. Our whole grain picks carry a whole grain stamp or list “whole grain” as the first ingredient, so you can trust you’re getting more of the good stuff. Heart-healthy picks keep the stress off your ticker with low fat, low saturated fat, low cholesterol, and less than 480 mg of sodium. Keep calm and stay regular with picks that provide at least 2.5g of fiber per serving while remaining low in fat. Master your sodium intake with these low-sodium picks, each containing less than 140 mg per serving! Power up with these picks, each containing at least 20% of the protein you need in a day per serving! Calling all diabetics! These picks are identified as sugar-free on the product label. Stay on top of your nutritional lifestyle with tags like dairy free, vegan, gluten free and organic . Think dairy-free is the way to be? Shop these products, guaranteed dairy-free by the manufacturer. Keep your basket vegan with these picks, identified as vegan-friendly by the manufacturer. Saying “no” to gluten? No problem. These picks follow FDA guidelines for gluten-free products. Our organic picks are guaranteed fresh by aligning with the USDA Organic Program, carrying an organic symbol, or containing organic ingredients. Keep up your healthy lifestyle and look for products throughout the store with tags like carb aware and dietitian’s top picks. Cut down on carbs with these picks, each containing less than 15g of carbohydrates and are low in saturated fat! Rest easy—these picks pack optimal nutrition and earned top marks from our team of registered dietitians.